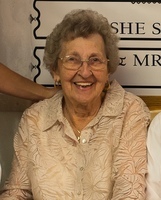 Provide comfort for the family of Frances Abbott with a meaningful gesture of sympathy. Frances “Jean” Abbott, 92, a longtime Lebanon resident formerly of Corvallis, Philomath & South Beach died on December 18, 2018. Jean was born March 6, 1926 in Sheridan, Oregon the daughter of John and Ruth Durst. Jean is preceded in death by her husband, the love of her life, Bill Abbott. Jean lived an adventurous life. In the 1950’s she and Bill built one of Oregon’s first restaurant chains, Richie’s Drive-In in Lebanon as well as two other restaurants. Together they owned and operated Kampus Market (currently Kellenberger’s Appliances) in Lebanon. Jean was also an antique dealer for many years specializing in glassware. She was also a travel guide leading groups around the world on tours, traveling to Russia, Africa, South America, Europe, Caribbean, and the Orient. Perhaps her crowning achievement was being a private airplane pilot winning the prestigious “Petticoat Derby” race in 1963. Jean loved being with her family fishing, camping, exploring, and hunting. Jean traced her heritage back to the founding of our country and was a Member of the Daughters of the American Revolution. She was also a member of the Women’s Pilot association the Ninety-Nines. The family would like to especially thank the Lebanon Samaritan Hospital and the caring staff at Evergreen Hospice in Albany. A memorial service is set for 11 a.m. Saturday, February 9th at St. Martin’s Episcopal Church, 1461 Grove St. in Lebanon. In lieu of flowers, donations can be made to St. Martin’s Episcopal Church and sent in care of Huston-Jost Funeral Home, 86 W. Grant St, Lebanon, OR 97355. To send flowers in memory of Frances "Jean" Abbott, please visit our Heartfelt Sympathies Store. Provide comfort for the family of Frances "Jean" Abbott by sending flowers.